Wash and trim the hard end from the brussel sprout. Slice in half and then julienne, so you have lovely cross sections. Melt butter in oil and heat over medium. 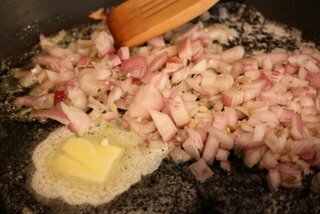 Add shallots and garlic, cooking until the shallots are soft. Add brussel sprouts, tossing to cover in oil and butter and a little salt. Keep stirring and cooking till the brussels are soft and charred a bit. Pour brussels into a serving bowl. Add toasted walnuts, cranberries and balsamic vinegar. Toss. Season with salt and pepper to taste. Note: I’m guessing that adding some feta cheese to this would be awesome. Try it and let me know! I’ll try this recipes at Home. Can I add a few pieces of fruit ? oh, yes! i think that would be swell.. certainly berries would work well, or maybe even a granny smith apple? let me know what you try. 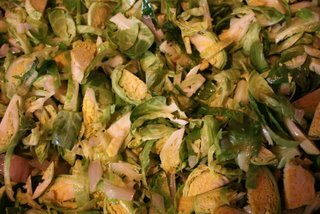 Good, Brussel Sprout Salad Recipe |. Hi! 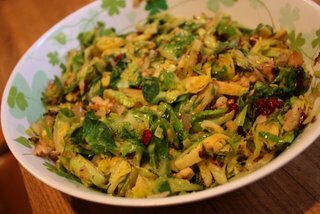 I found your page through another blogger on whose page you commented, and I am SO excited about this brussel sprout salad recipe! I can’t wait to try it out with some of our just-in-season farmers’ market brussel sprouts. Thanks! 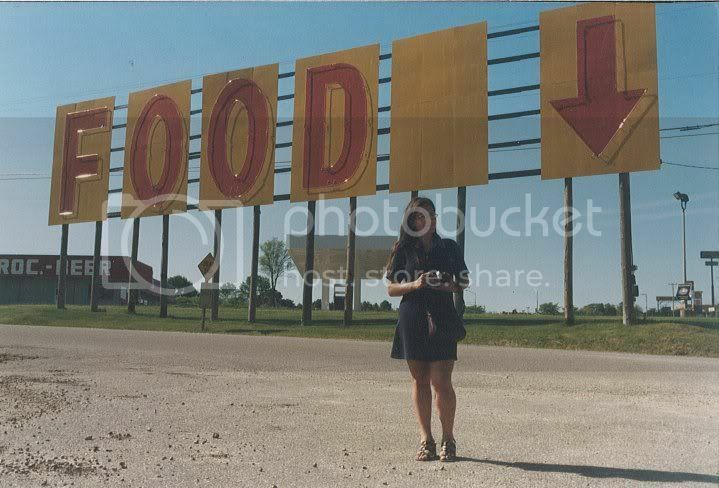 Oooh, please come back and tell me how you liked it! I’m such a lover of brussel sprouts, I feel like I could eat them everyday for the rest of my life, so if you have other recipes that you like, let me know!